White furniture is all the rage right now! 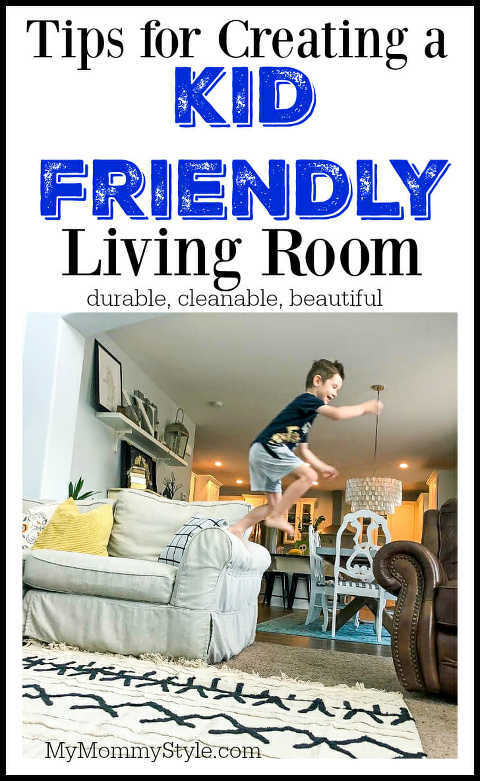 So how do you make a living room kid friendly that is bright and livable? I have loved the choices we chose for our home because it makes my life as a mom so much calmer. Choose furniture that is easy to clean. We have a long, narrow family room that isn’t perfectly square. I wanted to find a couch that would square off the room a bit and make it feel like a place that we could watch tv, read books, play games, and yes, even have pillow fights. We found this Pottery Barn couch and it was the perfect fit. It was made of a sturdy, washable fabric, but it was also light and beautiful. The cushions were made extremely well so that they hold their shape and can literally take a beating. The best part??? I can pull it all apart and throw all the cushion covers in my own washing machine! I even use my dryer, but if you want to be super careful hang drying or laying flat to dry is a great option too. Keep in mind that you can put together any configuration you need to fit the space of your room. After six years the arm of the couch was fraying and I began looking for a replacement. The cover cost nearly as much as a brand new set somewhere else, but because it still was in fantastic shape I decided to pick out a new fabric and cover the same couch! I picked this Sunbelt fabric because it was a light grey herringbone design that I love and I can wash it in my washing machine. This one frays a bit more on the inside than my last one did so I would suggest zipping up the cushion cover before sending it through the wash. Choose furniture that can be jumped on. This may sound nuts, but we literally picked out our ottoman KNOWING it would be an obstacle in the room. Between the pillow fights, blanket forts, and movie nights we knew we were come out ahead buying something that resembled more of a mattress than a glass wall. This ottoman isn’t real leather, but I have loved the basic design and that it still has a classy look to it without being sharp or jagged for little ones to get hurt on. This may be considered strange, but we literally bought the leather recliner as a safe place for food/drink in the family room. Well, technically my husband insisted on it when we were picking out furniture as his “captains chair”, and I realized soon afterwards that it was a life saver! We allow “clean snacks” fishy crackers, fruit snacks, etc on that chair only and it is an easy chair to clean. We have had some spills on the couch before, but for the most part the kids get it and they will go to the leather chair if they are just dying to have a snack while they watch their favorite episode of Garfield. What!? Did you know there are such things as washable rugs??? I have two rugs from Lorena Canals, one in the nursery, and one in the family room and I love them both. I am still able to enjoy my light/geometric modern look and I can still THROW IT IN THE WASHING MACHINE! Yes, it is completely washable and it takes away a lot of worry when I think of what could possibly happen with four little ones running around the house. We love this Ecuadane blanket as it is made from recycled products and so cozy. This is the rug we have in the nursery, I love that I don’t have to worry about the spills or messes that happen here either! Many times I’ve had friends ask how to put pieces together that work for a young family while not giving up style. My favorite way to do this? Surround yourself with things that make you feel happy! I love to do this by displaying favorite art works, pictures of our family, and throw pillows! Find items that work for giving design to the space but also double for storage. We do have a chest that stays at the end of the couch where the kids can keep their toys in for easy access. If it gets too full we have everyone take a bucketful back to the playroom. 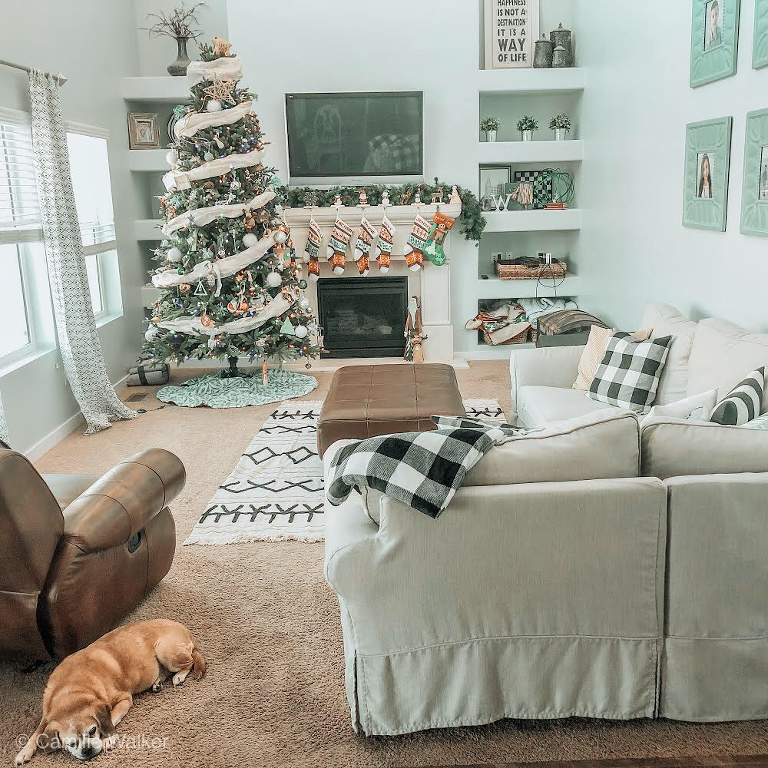 There are certain rules that have been made for travel paths, conversation, and Feng Shui, and while that can be considered, above all you want to make a space that makes you feel at home. You can have light, bright furniture with kids, just make sure to buy products that are made well and wash well.